The resources and generous advice on this forum have been crucial to getting me up to speed in microphotography with a minimum of costly errors. Thanks!!! I got a Mitutoyo 10x as recommended by many here, and that was great advice. I tried it on my Nikon D90 APS-C sensor, using butterfly wings as test subjects, and I noticed that when a white butterfly scale edge lined up with the pixel grid, there was only about 1 (or maybe a fraction more) transitional pixel between the white of the scale and the dark of the background. This suggests the sensor pixel coarseness (181 px/mm) may be limiting my resolution. I happen to be borrowing two bridge cameras with much higher pixel resolutions, and one of them, the Sony HX400V, is a superzoom with a Zeiss 215mm lens. Perfect for a tube lens with the Mitu. It has 840 px/mm, more than 4x the linear resolution and 16x the the number of pixels per unit area compared to my D90. So I made a very casual test. No stacking, no tripod, no nothing. I just set the camera on a flat marble tile supported by foam, and put the subject on the same tile. No flash, just an Ikea LED (another great forum recommendation). 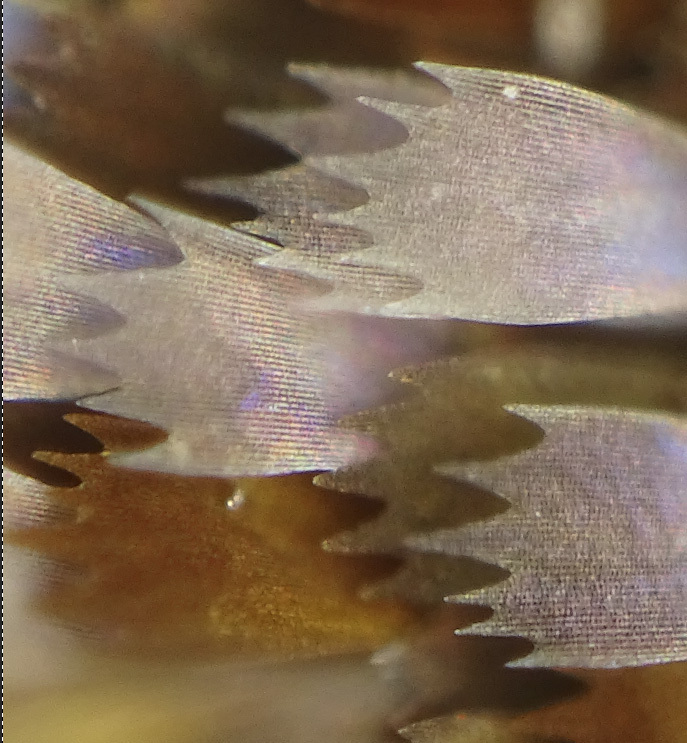 No focusing rail, just moved the butterfly wing by hand until it seemed sharp. 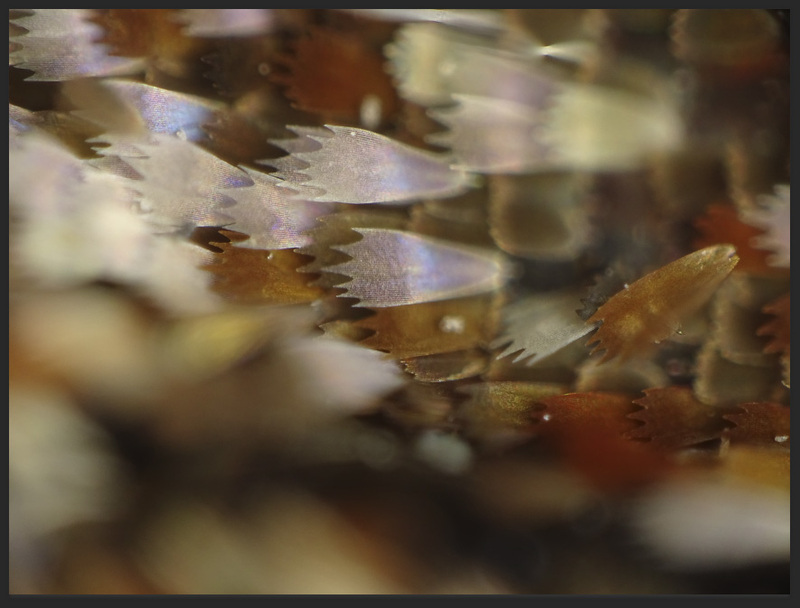 Here is the result, first the full frame reduced to fit the posting limits, and then a crop at 50% magnification. These are jpgs straight from the camera. I was surprised how nice they were. I conclude that the Sony makes useful tube lens + sensor for the Mitu! I think it may resolve a bit more detail than the Nikon, though not much more. Later I'll post an example from the Panasonic FZ300. This is an amazing camera but its beautiful Leica zoom lens is only 108mm max (600mm f2.8 equivalent in 35mm photography!). I am going to experiment with front-mounted teleconverters on it to bring its focal length nearer to the Mitu's desired 200mm. I should add that there is a little bit of vertical ghosting visible in the image, but that should go away if I use flash or take more care in mounting the camera and subject. Lou, thanks for the report -- very interesting. In terms of image quality, there's nothing special about 200 mm. 3) the combination of rear lens focal length and sensor size should be matched so that the sensor is covered by high quality image. The only thing special about 200 mm is that's the length required to make the objective + tube lens have a combined magnification equal to what's printed on the objective barrel. If you ignore the label on the objective, then 200 mm ceases to have any special role. It is common practice to use longer or shorter rear lenses so as to get higher or lower magnifications that provide a good fit to the sensor size. The sensor size on the Panasonic FZ300 is only 6.17 x 4.55 mm -- a diagonal of 7.66 mm. In comparison, a typical APS-C sensor has a diagonal around 28 mm. So, compared to using a 200 mm tube lens on an APS-C sensor, the corresponding focal length for the FZ300 is only 200*(7.66/28 ) = 54.7 mm. Increasing the tube lens focal length even farther may result in some slight improvement in mage quality over the area of the subject that is still covered, but of course that area will be much smaller than what you'd cover with a shorter tube lens. It's the usual tradeoff. If you're interested in a specific area on the subject, then the best approach is to raise the magnification so as to cover the sensor with that area. But if you want to get the sharpest image on the sensor, you should lower the magnification so as to pack as much detail as possible into the fixed area of the sensor. Different techniques for different goals. The usual problem using an objective with zoom lenses of all flavors is that zoom lenses usually produce vignetting if they are set to much less than their maximum focal length. It would be very interesting to hear how far back you can reduce the zoom on the Sony bridge cameras, before the corners of the image start to go unacceptably dark. Rik, thanks for your comments. I hadn't realized that there was nothing special about the 200mm focal length. I had assumed that since the lens was designed for that tube length, it was probably optimized for it. Good to know that is not the case. I've been using tube lenses of different lengths, from 135mm (Komine Vivitar) to 500mm (Canon 500D close-up lens used like a Raynox to make a giant tube lens), but I had always intended to make 200mm (my Raynox or my 200mm Nikkor-Q) the default. Now I have a rough answer, comparing this high-pixel-density image to the low-density image of the same object at the same magnification on my Nikon D90. I assume the good-quality portion of the image cone of the Mitu + 200mm tube lens exactly covers an APS sensor, as people complain that it can't be pushed down on a FF sensor. Using a 200mm tube lens, my tests show the linear pixel density of the Sony (840pixels/mm) is somewhat higher than it needs to be (maybe by a factor of 2). The linear pixel density of the D90 (181/mm) is too low. Something around 400px/mm would be adequate. That means an APS-C sensor should be about 9000 pixels wide instead of the current 4000-5000 pixels, in order to resolve all the detail in the Mitu's image. This number is independent of the tube length. No matter what magnification we use, if we want to get all the detail out of the aerial image, we should use a sensor 9000 pixels wide, covering the whole image cone. At 400mm, then, the sensor should be 48mm wide and have 9000 pixels. A FF sensor should have 9000 pixels and should be used with a 300mm tube lens. Removing the anti-alias filter might get us close to this level on the newest APS-C sensors with higher pixel counts than my old D90....and some of Nikon's newer APS-C cameras do have that that filter removed. Thank you for the further information. Yes, what you say makes sense. We are getting down to the area where there is a broad range of answers depending on exactly what question is asked. But of course this requires that we first choose the wavelength lambda. It is traditional to use green light lambda = 0.00055 mm/cycle, leading to a cutoff frequency of nu_0 = 102 cycles/mm. From that, the Nyquist limit of 2 samples per cycle says that we need at least 204 samples/mm. But other considerations suggest that at least 3-4 samples per cycle are needed to avoid unacceptable loss of contrast for badly positioned image features. So already -- assuming green light -- we're up to needing 300-400 samples/mm. Pushing the issue farther, suppose that the subject is blue instead of green. Then we might be looking at lambda of say 0.00045 mm. Even more importantly, the sensor resolution for blue light is effectively only half that for green because of the Bayer filter grid. Taking those numbers as givens, one could make a plausible argument for "needing" a full 1000 samples/mm. The field size of a Mitutoyo objective, at rated magnification, is also not limited to APS-C. As shown at http://www.photomacrography.net/forum/viewtopic.php?t=23898, using a 36 megapixel full frame sensor without an anti-aliasing filter, my Mitutoyo 10X does a competent job clear to the corners, given a suitable tube lens. From that, and assuming only the 300-400 samples/mm for green light at 3-4 samples/cycle, we can derive a number of 10,800 to 14,400 samples across the frame. Scale by about 2.4X for blue. The numbers get a little silly at this point. Given the sensitivity to exactly what assumptions are made, I think it's very helpful to have direct image comparisons to work with. The one that you've provided is very helpful. Thanks!